500,000 People Will Pass the GED This Year. Passing the GED 2002 Math Test is about critical thinking not just knowing facts. Millions of Americans are locked into dead-end jobs because they do not have a high school diploma. A day-long exam called the General Educational Development test or GED provides the equivalent of a high school diploma - and better chances in the job market - for those who pass it. Nearly 800,000 people take the exam each year and about 500,000 pass. Brush up on your basic math skills. Getting started is as easy as turning on your computer and having "point-and-click" computer skills. You will learn your math skills as if you have your own private math tutor. Master the GED math skills fast and simple. When you take our GED practice tests, you will be told which areas of math you need to study. Your strengths and weaknesses will be based upon the five categories in our "Basic Math Series" -- "Fractions", "Decimals", "Percents", "Algebra Basics", and "Geometry Basics". 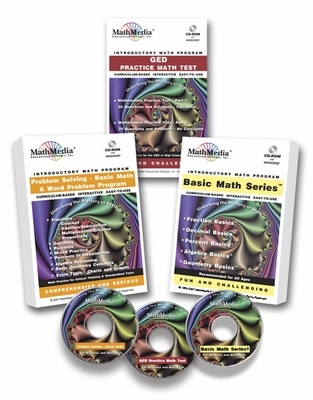 Once you have taken the practice GED math test, use the five Basic Math programs to learn your math well. If word problems are a weakness, practice, practice, practice with the included "Word Problems for Basic Math". Master the GED math test by using the MathMedia GED practice test to see if you know the material for the GED Mathematics Part 1 and Part 2 sections. The GED Math Test Preparation component is a replica of the "real" GED - Math Part 1 (25 questions, with calculator) and GED - Math Part 2 (25 questions, without calculator). Each question is a specific type of question - concept of fractions, concept of reading and interpreting data, thinking, analyzing and using skills from basic math. For that reason, the GED is bundled with the Basic Math Series. That is the math you must master to do well on the actual GED - Fractions, Decimals, Percents, Algebra, and Geometry. Since half the test is without a calculator, if you are weak in arithmetic skills, we suggest you consider also purchasing the "Arithmetic Series". What is the GED Math Test Preparation component? The GED Math Test Preparation component contains a comprehensive practice GED Math Test - Part 1 and Part 2. The problems are typical GED Math questions along with the complete step-by-step solutions to the final answer. Also, each question number usually contains more than one question so you will be receiving added practice on that concept. The actual GED has mutliple choice questions and fill in the grid answers. This practice GED math test requires the student to come to the final answer without seeing multiple choices. Once you have mastered these math skills, you will have the confidence to take the GED math test at a test center near you. You may locate a test center at http://www.acenet.edu/resources/GED/center_locator.cfm . To GED teachers and facilitators: This software is currently in use in adult education schools across the country. It is being used as a supplement to the classroom teaching as well as a stand-alone product for students who do not have access to classroom instruction.